Pearl Izumi's top-of-the-line short offers optimal fit, performance, durability, and comfort. The P.R.O. In-R-Cool Short features P.R.O. Transfer In-R-Cool® fabric with coldblack® technology for optimal cooling and sun protection. Fast-drying 37.5 Minerale™ active-transfer polyester has been added for excellent moisture wicking properties. The short's multi-panel anatomic design contributes to its exceptional comfort, and welded-construction silicone leg grippers hold everything in place. The Anatomic P.R.O. Seamless 1:1 Chamois is Pearl Izumi's most advanced chamois for chafe-free comfort on rides of any length. Reflective elements add low-light visibility. The P.R.O. In-R-Cool Short features a 9" inseam (size Medium). Available in various colors. 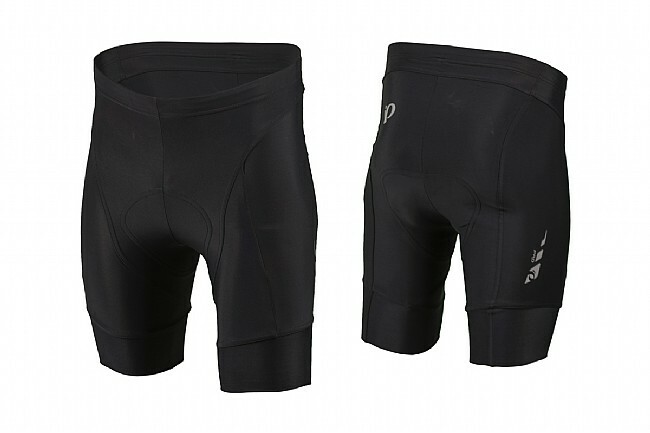 Excellent Bike Shorts - Pros- These shorts are the most comfortable short you can buy. Great if you are out for a short ride, but where they really shine is on longer days in the saddle when your are touring or you are out for another century ride. Cons - They are pricey. Fit runs smaller than sizing chart. I purchased these to replace a pair of the same, that have been my go to shorts for long rides, as they are very comfortable. Unfortunately, I have not used these, as they are simply too small, despite the sizing chart. I started with PI many years ago but as they needed replacing I decided to try some of the other popular brands (Italian, French...). I found that the PIs, with the 1-D chamois are the best fitting and most comfortable shorts for me. I have noticed lately that the sizes are getting a little smaller so you may want to order up a size. My only complaint is that after about 2 years the black fades to a copper making it appear as thought they are see-thru! However, PI has replaced the affected ones - nice! I am 6-2 and have been using a size XL. I ride about 150 miles per week. Not a good value, very different from prior vintage PRO short-try them on before your buy! A couple of years ago, I rode across the USA using three different brands of bike shorts-averaging about 75 miles a day. My going away favorite pair of shorts were the Pearl Izumi Pros with the red chamois. Based on this experience, I ordered the latest version of the PROs about three weeks ago over the internet. For me, the chamois (green color) is far from adequate-too thin- for long days on the bike. I am getting ready to leave for some serious biking in Italy and I will not even be taking these shorts. Recommend wearing them for rides less than 40 miles. The new Pro shorts (green chamosis) are very different then older model Pro shorts(red chamosis). First, they are shorter. Second, the material at the bottoms is looser, and does not grip the quads as much. Third, the sizing is way off. The new model runs a size smaller then the older model. Finally, the chamosis is a different shape, thickness, and material. These are still very good quality and feel, but if you have been using the older version, be prepared for a different experience. Last year I bought the PRO shorts and loved them. I always wear Medium and when I tried on the new ones purchased in 2015 they were too tight. Not slightly too tight, but very constricting and uncomfortable. I only have a 30 inch waist, so this is strange. Not only was the waist tight, but the leg panels narrowed very oddly. So, I exchanged them for Large. Even the large size is, while plenty roomy in the waist, tight in the thighs. I don't understand what Pearl was trying to do with these, but they failed. The only thing good about these are the insert. My experience is that these run one to two sizes smaller that what the size chart says. The chamois was comfortable and didn't chafe at all on long rides and on climbs. I'm 5-7, 165 lbs, with a 31-inch waist so I ordered the size medium. The shorts ran small and I literally have to pull the shorts up my legs a little bit at a time because they're extremely tight. I checked the label to make sure the shorts were a Men's size medium and it was. I have used several Pearl Izumi PRO shorts. The new anatomic seamless 11 chamois is excellent and very comfortable on long (50mi) rides as compared to the older 3D chamois. I highly recommend them. I've always like Pearli gear, since back in the eighties when it first came out. I have kits by the Italian masters- Capo, Castelli, Giordana, and own plenty of Assos stuff as well. Pearl izumi compares very well and saves a few bucks too. These shorts fit well in a medium for me (I'm 5' 9, 137lbs.). They are comfortable in the waist with enough material around the hips to avoid any exposure. The leg band is smooth without any binding material to ride up or become uncomfortable. The medium would probably work well if your weight goes to the low 150's depending on your physique. For those who prefer shorts to bibs or just like having a choice (like me), these work very well. A comfortable yet simple chamois is nice as well- too much contouring and overdoing it with chamois these days, I think. I dig the color schemes and bought a matching top that's quite comfy as well. OK, but not as good as the previous version. The new version of the P.R.O. In-R-Cool have shorter legs and tend to ride up. The chamois is very different, but so far seems to be OK. It would have been helpful if the changes had been noted. PI P.R.O. In-R-Cool Short is form fit and stylish! I am a club roadie averaging about 40mi per ride. I am 6ft, weigh 180 with a 34X34 casual pant size. Pearl's sizing chart recommended a L in this pant, which I ordered first and found to be too tight. I exchanged it for an XL which fits perfect. It has good compression around the quads, the legs are a great length extending to the bottom of the quads and do not ride up, the waist is secure, and the chamois is the most comfortable of all the Pearl designs I've had. They also look good with the PRO LTD Jersey! Hope the sizing suggestion helps if you are looking for an awesome short. Pearl Izumi road cycle shorts are my favorite. Feeling very confident in purchasing these shorts only to be disappointed with the chamois padding as I see no comparison to the existing 3D P.R.O. The fit was true to size, however the chamois was to thin to mention. In fact it didn't even extend through the entire chamois. I return them instantly for a refund. I ride mountain and cross in So Cal. Need shorts that can vent a lot of sweat and stay up. Replaced my tired top line pearl izumi's - with the new model. I preferred the old model (more supple and had a draw string in addition to the elastic waist band). Best part about the new model I don't notice or think about them at all when I ride. They wick great and stay up. Sweet! These are a model of minimalism- the integration of the pad is a work of art. Over the years I've tried other brands. None fit and function as well as these. Worth the price. I have 5 pair. No other short compares to them. They are very comfortable. Especially good on the hot summer rides and for the long 60 mile rides. Padding a little too thick and bulky. 1 of 5 customers found this review helpful. Every day rides. I like the way the shorts are made. Good waist band and good bands around the legs. Padding just a little too bulky for me . Kind of rolls up on the edges to chaff. My third purchase of these shorts - historically they have been durable and hold up to a lot of riding / washing. The ones just purchased appear and feel slightly different than my older ones. Too early to really tell but they seem to have gone down slightly in quality. These shorts are longer and grippier in the leg than many others. Even better they improved the chamois by making it firmer than the Spring 2013 model. This feels better than the old, as it does not compress as much and hold its shape better. The materials hold up very well in long-term use. At the sale price this pair of shorts is a terrific value. Construction seems sound, but I do not find these shorts anywhere near as comfortable as the P.R.O. shorts from just a couple of years ago. There is also very little room in these shorts for your naught bits. Pearl Izumi P.R.O. one of the best I have ever used. These are one of the best shorts on the market. Fit is good, cushioning is better.